No one works harder than working mothers. But caught between the twin pulls of your job and your children it can seem impossible to meet so many demands. One of the areas that parents worry most about is their kid’s education. The complication added by being a working Mom is that time is often at a premium. Many people consider hiring a private tutor to help, but whilst that can have advantages, it’s not the only way to proceed. The good news is that you don’t need to be breathing down your kid’s neck to get them to study effectively anyway. There are in fact a number of simple and effective tips to help you to help them to make the most of their education. If time is as a premium (and who are we kidding of course it is!) then effective time management is extremely important. Yes, there are plenty of apps that can be downloaded onto phones that share diary entries, etc, etc. But actually one of the best time organizing tools is a simple wall planner, divided into months and days. 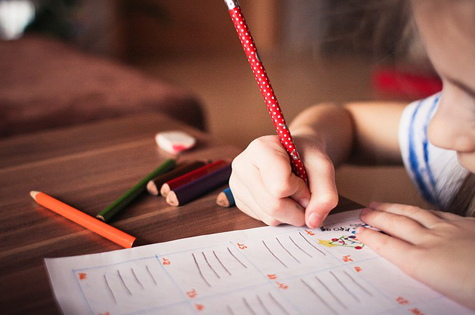 Make it a rule that your kids enter homework assignment dates. Test dates, parent/teacher conference dates all onto the planner as soon as they get them. That way, at a glance, you know what needs to be done and when – and you can make sure everything is on track. Sometimes kids just don’t understand the aims of a part of a class or even a whole course. Often, you only find that out when you receive a poor report card! Don’t let it get to that stage. Instead, make the time to sit down with your children and make sure they understand the aims of the lessons they are studying – try to do this weekly so you can nip problems in the bud early. Most teachers will provide a course outline or syllabus so that you too can grasp the overall aims of the lessons – if they don’t supply one, ask why not and add that they should really consider changing that stance! The Internet. It’s very easy for adults to disappear on the web for several hours when they should be working and it’s just as easy for kids too! At the same time however, in today’s educational system it is going to be hard for them to study without the Internet. So many secondary resources are required; the Internet is an essential tool. So you can’t just switch it off during study time. Instead, it is possible to download apps and programs that disable access to specific sites. This means you can stop them disappearing onto Facebook for several hours, whilst still leaving the bulk of the Internet available to assist with their studies. If you can, set aside an area within your home that is the designated study area. It can be as much as a room if you have one spare, it can also be as simple as a single, designated chair at the dining table or a kitchen stool. The actual area itself isn’t too important. It’s the idea of a study area that matters. The idea is that once the child is in the study area, they are studying. Period. The alternative, that they study where they please, means potential access to distractions. Sat on the sofa studying can turn into a TV channel surfing session very easily indeed. Try to not make studying seem like a chore. Yes, sometimes your kids don’t want to do it. Yes, sometimes they will push back. Sometimes you just need to believe in your kids and believe in their abilities to do the right thing. Use the tips above to encourage and guide them but be wary that the more you push them, the more resistance you may encounter. Remind them how proud you are of them. If they have a goal, such as acceptance to a particular college or a specific career path, consider a field trip to visit the college or a company in the industry they aspire to. This kind of positive association – between studying and achieving goals – will get more results, and less arguments, then negative tactic like threats and nagging. Annabelle is part of the Content and Community team at SmileTutor, sharing valuable content to their own community and beyond. Annabelle’s passion is connecting parents and children who are looking for English tuition in Singapore.